A custom spray foam rig can be a great asset to any contractor with a growing company. Custom rigs make spray foam installation jobs easier and more productive. Custom foam insulation rigs take all the equipment necessary for the job in one conveniently portable unit. They provide flexibility for a crew to move quickly on the job. They help make prep and cleanup a breeze. Custom foam insulation rigs can come in a couple of different transportation variations. Many spray foam rigs are simply built within an enclosed trailer so that they can be pulled behind a pickup to and from the job site. When you are done transporting, just unhook and go about your day. On the other end of the spectrum, you have the box truck spray foam rig. These units are built a box truck that is connected to the cab of a vehicle. These units have the advantage of convenience, but can be pricier. A relatively new offering on the market is the compact unit. These new types of spray foam rigs are growing in popularity because of their small footprint and reputation for versatility. When you’re purchasing a custom spray foam rig, it is always a good idea to think ahead to the future. For example, how will you handle machine maintenance? Choosing a rig with a robust service network is important to securing a unit that will last and will not be out of commission for long if there are every any issues. If your rig is not properly maintained, then your very expensive spray foam equipment is likely to break before it pays for itself let alone turns a profit for your business. Thankfully, spray foam rigs are more than capable of paying for themselves if there is a good business person managing operations and the equipment continues to be properly maintained. Another very important consideration when choosing a custom spray foam rig is the needs of your business. Remember, to consider what your employees want. Make a list and prioritize all the users’ needs and your budget. For example, if your company only does large houses in wealthy neighborhoods or commercial jobs, you will want a much more robust rig than the guy next door who replaces roofs on tiny houses. So, in this way, it is important to enlist the help of your team members to discern the best spray foam rig and equipment set up for your business. Working for a roofing contractor can be a dangerous job. However, working with your hands can also be very rewarding. Prioritizing crew safety when you are selecting a custom foam insulation rig is a good idea. For instance, be sure that your crew has access to first aid in their mobile workstation. A messy workstation can be a dangerous one. You want to incentivize your employees to take care of themselves, equipment and others so that morale stays high and your crew’s productivity continues to grow. Another important consideration when building a custom spray foam rig is where you live and work. Although we live in the age of air conditioning and most people have control of their environment, walking outside is another story. So, remember to think about what the weather will do to your brand new custom spray foam rig when it reaches your area’s extreme weather conditions. Will the equipment that you have chosen for your custom foam insulation rig work in extreme heat or cold? Is there good ventilation for the crew and equipment during summer? Can foam technicians move the unit to safety quickly when inclement weather threatens to hit? 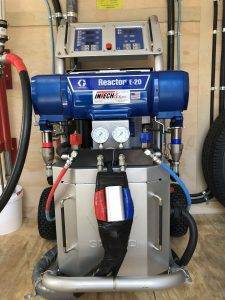 These are all very important considerations to make sure that your spray foam rig will continue to function well all year long, and not cause any unnecessary downtime. Intech Equipment & Supply specializes in building and selling custom spray foam rigs. Contact us to review your needs and find the right rig for your business and your budget.